HBO PARTNERS WITH GLOBALTAP TO IMPLEMENT 100 WATER TAPS IN SCHOOLS ACROSS THE NATION AS PART OF A NATIONAL EFFORT TO COMBAT OBESITY. In the U.S., 68% of adults age 20 and over are overweight or obese, while 31.7% of the nation’s children and adolescents age two to 19 are overweight or obese. To address these staggering statistics, HBO explores how Americans are eating too much too often, and not getting enough physical activity. 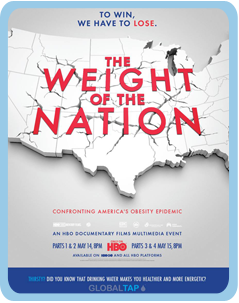 As part of THE WEIGHT OF THE NATION documentary series debuting in May; HBO is partnering with GLOBALTAP and the Whole Foods Market’s Whole Kids Foundation to help combat obesity at a local level by implementing 100 water tap stations and salad bars starting in 12 cities across the nation.